Four men have been arrested on suspicion of murdering an inmate who was stabbed to death at Wormwood Scrubs prison. Police said 25-year-old Saleh Khader was found with stab wounds at the west London jail at about 15:19 GMT on Wednesday. He was pronounced dead at the scene despite the efforts of paramedics. Two men aged 21, a 20-year-old and a 23-year-old man, who are all prisoners at the jail, remain in police custody. The Met Police said the victim’s next of kin had been informed and a post-mortem examination would be held in due course. Built during the Victorian era, Wormwood Scrubs is a Category B prison with a capacity of 1,279 inmates. Records from December last year show 1,131 prisoners were being held at the jail, based in East Acton. An inspection report published in the same month found the jail had chronic staff shortages, food supply issues and a surge in violence. 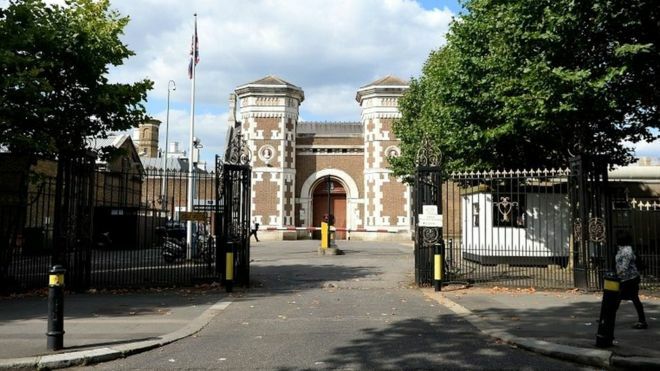 HM Inspectorate of Prisons warned that Wormwood Scrubs was “still not safe enough”. At the time, the Ministry of Justice said the jail was recruiting staff in a bid to “urgently” raise standards.